My High vs Low feature for this week is a pair of moroccan inspired rugs. The look is subtle, gender neutral and can work in a traditional or modern setting. 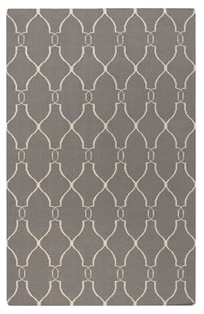 This first rug the Steel Brooke style Madeline Weinrib rug. 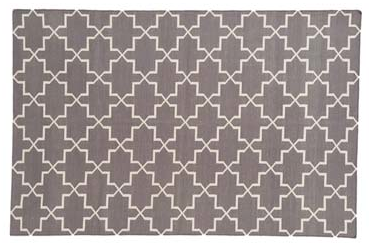 The rug runs around $800 (for the 6x9) and the lead time is around 16 weeks since it is made to order. The rug does come in many vibrant color options as well. 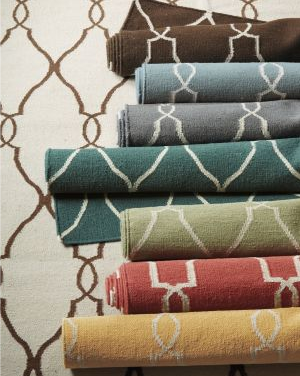 The Bogart Flat Weave Wool Rug available at Garnet Hill is only $328 (for the 5x8) and also available in an assortment of colors (shown below) and sizes in stock now. I was thinking the same thing when I saw those in GH. Not a bad alternative. I still owe you details about the oversized pins. I'll get on it! Love this option! Great find. I love Garnet Hill, not only do they have some great finds for the home they have cute ensembles for little girls.